My office has been my pit of despair for a while now. Piles of beads, pendants, scrabble tiles, everywhere, not to mention the paperwork, was all out of control. Part of the problem was I didn't have enough shelves to put all my trays. It is always bad after the busy holiday season, which of course is my busiest time of year where it is pretty normal to spend at least 10 hours a day from Oct - Dec working on something or other related to my business. So, I finally decided enough was enough and I wanted a new office space with more storage, work surface, and lighting, and I am getting it! We are building cabinets all around 2 walls, and I couldn't be more thrilled! Here are some of the inspirations I found for my new creative space. :) I can't seem to get them to show up as a slide show, but here is the link to my idea book. 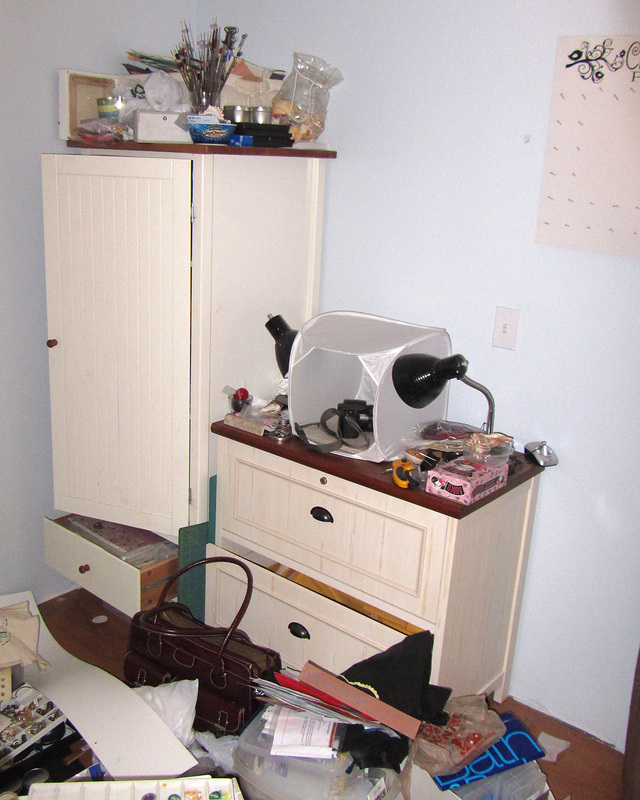 Now, for every great makeover is the dreaded before picture. I can't believe I am going to post this, but what the heck right? LOL! I bet most of my creative friends all have a space like this where they create. Hopefully theirs aren't as bad as mine is. I will say this in my defense, this is as bad as it has been in forever, I just had no time or energy to even try to put things away after finishing things up for orders, and shows. So here it goes. My computer area where I do all my listings, photo editing, well all of the "work" part of my job. LOL! 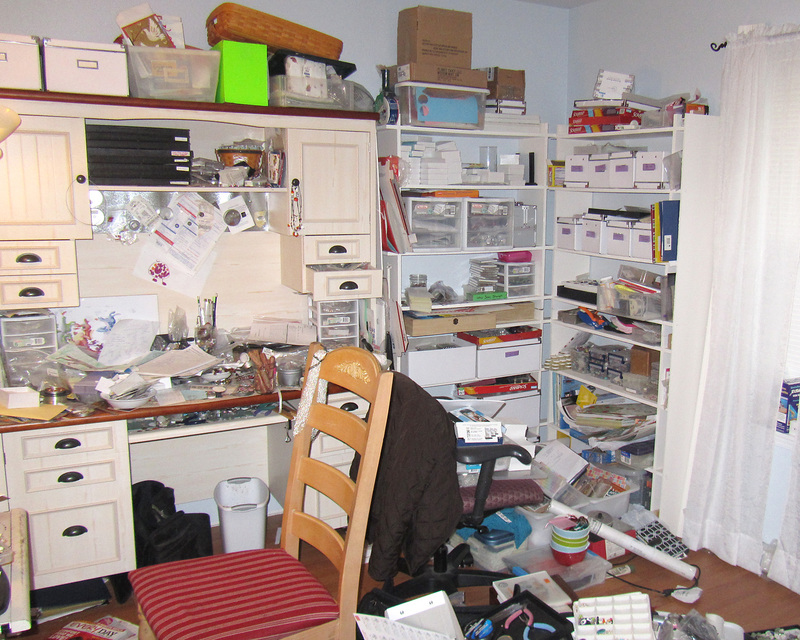 This shows the jewelry creating area and to the left are shelves that are home to many things. You name it, it is probably there! The tall cabinet is home to scrapbooking supplies and the lateral file is home to shipping supplies and of course my photo set up. 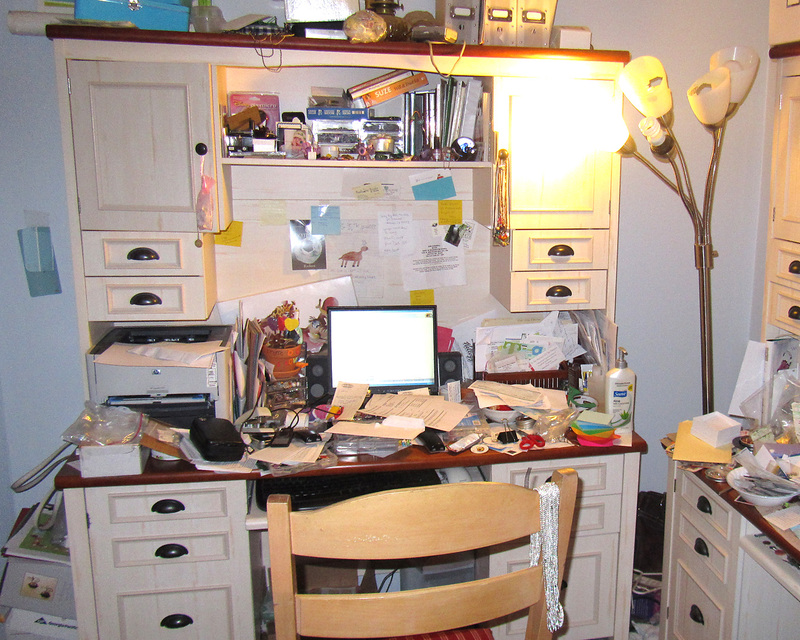 So there you have it, my disaster area that has been driving me crazy. It is no longer there, but now everything that was in there is now all through out my entire downstairs as we are in the building process of the new office/creative space. Can't wait until it is done. I want my kitchen table back! LOL! Good luck! I bet it will look awesome when it is all finished. Love ya!